Wow. 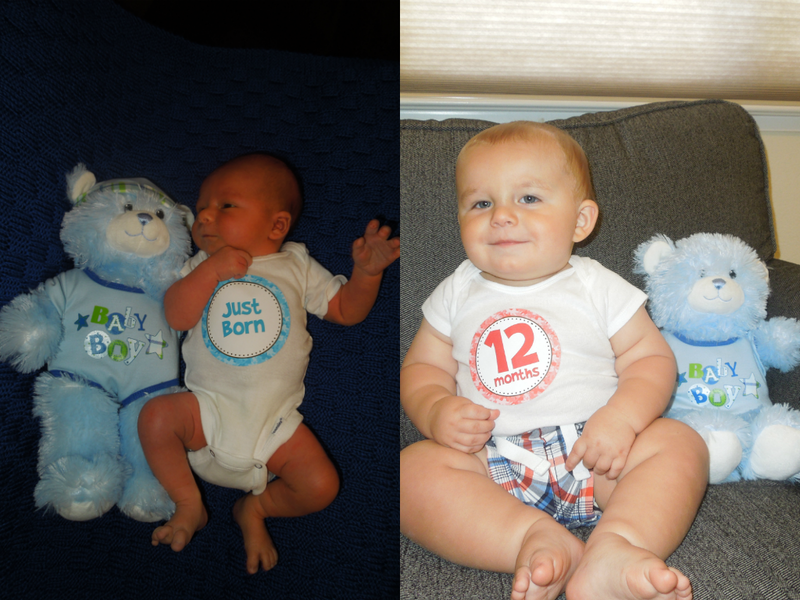 I am truly blown away that an entire year has gone by since I met the most amazing little boy on earth! This year has been the hardest and most exhausting year of my life - but also the most incredible! I love being a Mommy more than anything! Matt and I still find ourselves staring at him in awe, wondering how we made something so beautiful and incredible. He is doing SO much! He says Mama, Dada, Dog, Ball (although it doesn't sound much different than Dog) and all done. He can sign "more" and can do "eat" with a tiny bit of help.Speaking of eating, this boy LOVES his food. He is learning to feed himself with a spoon and often insists that he do it himself even though he's not highly successful by himself yet! He is getting really good at eating finger foods, so we can feed him off our plate most of the time (as long as I think it's healthy enough for him! ;-P ) Here he is eating one of his favorites - spaghetti! He crawls around like a maniac and isn't all that interested in learning to walk. He has taken four steps at a time and could probably do more, but he would rather sit down and go for the crawl. He walks around with his walker toy really well, though, and can even steer it! He also "cruises" on furniture and the walls with ease. Here my little trouble maker is trying to get to the electrical outlet. He loves fans and lights (especially watching them turn on and off) and he will beg to get someone to let him flip the light switch. It's kinda cute, so he usually gets away with it! Overall we are pretty amazed with how well he is able to communicate now even though he has very few actual words/signs. He will point, grunt, gesture, cry, etc. until we figure out what it is that he wants. It's pretty cool! Landon's first birthday party was so much fun! We were worried that the heat would ruin the day, but with a couple of easy-ups for shade and a baby pool to splash in, the day was just right. He loved smashing his cake and loved all the attention even more!